For the last two decades, backpacking has become a passion. I am a four-season backpacker and an off-trail navigator. Although I do take yearly trips to the American West or Southwest, the majority of my trips are in Michigan and Canada. My pack weight varies considerably, but my base weight is under 14 lb (6.35 kg). I am primarily a tarp camper who averages over 50 nights a year backpacking in a huge variety of weather conditions including relentless rain, wet snow and sub-zero (0 F/-18 C) temps. The Ibex Razzel is simply classified as a women's long sleeve top by the manufacturer. It is much more than that. Of all the wool products that I own (or have ever seen) the Razzel is likely the most stylish as it features ultra fine New Zealand (17.5 micron merino) wool that has a jacquard pattern wove into it. 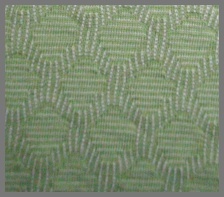 The jacquard has a wonderful texture and the pattern is almost diamond-like. This alone adds a dressier look to it. Instead of an ordinary turtleneck-like collar, it features a higher than normal neckline but not as high as a turtleneck. The neckline is not tight but gently rides on the lower part of my neck. 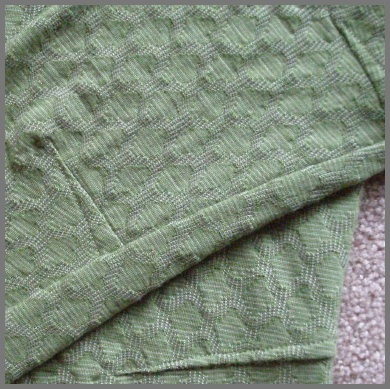 The top features an invisible partial zipper in the center of the front. This zipper is approximately 13 in (33 cm) in length. The top is further shaped by having a ton of top-stitched darts (twelve) sewn in the fabric to compliment a woman's body. The darts are featured on the front of the shoulders, three on each sleeve, a pair of hip darts in the front and a pair in the back. All of them lay flat against the fabric. There is a Ibex symbol embroidered on the top center back of the garment a few inches (8 cm) below the neckline. As previously noted, the material that fabricates the Razzel is ultra fine merino wool that is rated 17.5 microns. That is the measurement of the thickness of the wool. With the number being so low the fabric is very fine. Reportedly the fabric is very strong, durable and light. As noted by the manufacturer it has "unmatched performance attributes like naturally odor resistant, temperature regulation and flame resistance." I purchased my Razzel top more than two years ago. I don't remember the actual name of the color but it could be described as Celery Green. The current colors are listed in the above chart. Women's sizes from S to XL are available. I have worn the Women's Razzel extensively during the last two years in cold weather. My best guess is that it has been worn at least four dozen times during extended trips and day outings. During the winter it is often worn as my base layer and sometimes as my overlayer (over a lighter weight crew neck merino wool top) if the temps dip below zero (0 F/-18 C). I often cover it with a shell jacket or down sweater. I almost always wear the Razzel during aerobic-type activities rather than for passive activities. This not only includes backpacking, but also trail running, mountain biking, snowshoeing, and cross country skiing. I am the most comfortable in the Razzel when temperatures are below 60 F (16 C). Although I can still wear it for activities above that temp, if I am carrying a pack or if the humidity is too high, it is simply too hot. However, the partial zipper is a great way to ventilate in those conditions as well as pushing up the sleeves. For most of my winter activities, the temperature does vary but it is rarely above 20 F (-7 C). I normally just wear a very lightweight shell jacket or vest over the Razzel. I rarely have to ventilate the top in those conditions but if I become too hot I just open the zipper on my outer garment instead. Although I have rarely worn the Razzel for causal wear, it is certainly attractive enough to be worn with dress pants or similar. I always receive compliments on its style when I am wearing it unadorned. 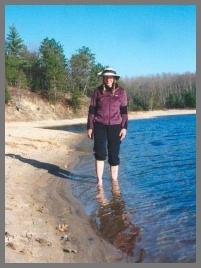 Most of my winter activities are in the states of Michigan and Wisconsin, USA. My area of travel covers hilly boreal and deciduous forests and frozen lakes. Elevations average about 600 ft (183 m) and temperatures range from a low of -20 F (-29 C) to nearly 60 F (16 C) in the early fall and late spring. I would describe the fit of the Ibex Razzel as being very feminine and shaped but not tight. It lays nicely on my body and there are no constricted areas. The darts add a definite stylish fit and the top is very attractive. 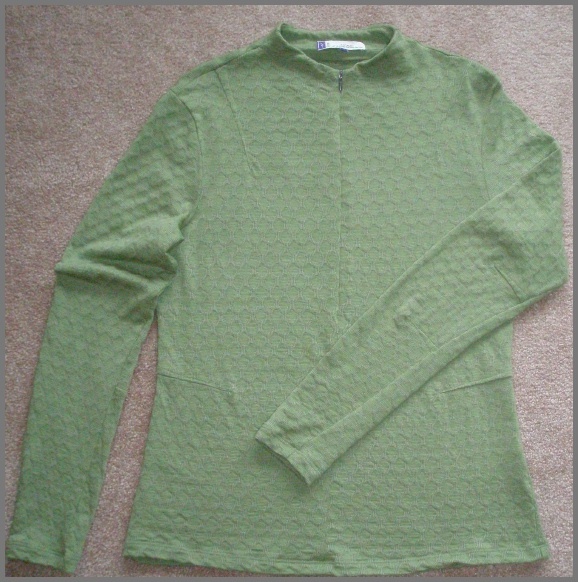 The set-in sleeves are finished nicely and the bottom of each sleeve and hem lay flat with double-stitched edges. Even though I would consider this a medium-weight top, the fit is nonbulky and can be layered very nicely with other clothing. I find that the Razzel is very soft against my skin and so comfortable to wear. The wool fabric is very breathable and even if I do create damp spots during heavy activity the top is still very comfortable to wear. The wool never feels clammy against my skin. The Razzel Top has been washed more times than I can count. I just machine wash (cold water) it with my regular laundry and then put it on my drying rack with similar items. The top has held up extraordinarily well. I really don't see any imperfections in the top after all this time. The only thing that I wish was different was that the neckline facing was more than tacked at only the shoulder seams. It sometimes has to be fussed with so that it lies straight underneath. I haven't noticed any odors to linger in the fabric even after wearing it for several days of activity without a wash (during backpacking). Being a big fan of wool products, the Ibex Razzel Top has more than exceeded my needs as far as performance, comfort, fit and style. I expect that I will continue to wear it for many more years in the field.